An undated photo of Elizabeth Taylor highlights her lovely eyes -- made even lovelier thanks to an extra row of eyelashes caused by a rare disorder. 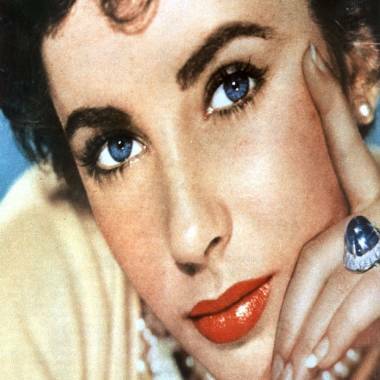 It's hard to imagine that some of the first words heard by the parents of Elizabeth Taylor, the actress considered the world's most beautiful woman in her heyday, was that their newborn daughter had a mutation. In this case, the mutation that Taylor had -- a double row of eyelashes -- only enhanced her exquisite face and stunning blue-violet eyes. Upon hearing the diagnosis, her mother reportedly thought, "Well, now that doesn't sound so terrible at all," according to the biography "Elizabeth" by J. Randy Taraborrelli. An extra row of eyelashes is known medically as distichiasis (pronounced dis-tic-key-i-asis) and it's a rare disorder. Eye specialists refer to it as an "accessory row" of eyelashes. Eyelashes normally grow on the outside edge of the eyelid and they may not always grow in one straight row, explains Dr. Aaron Fay, an ophthalmic plastic surgeon at Massachusetts Eye and Ear Infirmary in Boston. "What happens in distichiasis is that a hair grows where there is supposed to be an oil gland on what's considered the wet part of the eyelid." When hairs grow on the thin ledge of skin nearer to the eye, the lash can rub against the eyeball, creating three potential problems, says Fay. It can cause eye irritation as well as more frequent tearing in the eye, and it may even break down the surface cells on the eye and reduce vision. Sometimes these problems can be easily treated with eyedrops or an ointment, Fay explains. For some people, the answer may be wearing contact lenses, which can protect the surface of the eye, since the extra lashes will rub the lens rather than the eye itself. If those strategies don't do the trick, other treatments include pulling out the hair with a tweezer (don't try this at home), electrolysis, or a freezing procedure that destroys the hair follicles. It's hard to know whether Taylor had any eye problems from her lush lashes, but Fay says the hair on the accessory row is typically sparser and less robust than normal eyelashes. And it's more common to have the second row on the lower eyelid, but they could also grow on the upper lid. Distichiasis can occur in men and women alike -- even those who aren't movie stars. Sometimes it occurs at birth as it did for Taylor. But it can also happen in older age. And you might not be able to see it by looking closely in the mirror. A specialized microscope may be needed to detect another row. Distichiasis is much rarer than other eyelid abnormalities, says Fay. A condition known as trichiasis is much more common, in which the eyelash grows toward the eye rather than an outward direction. How about you, readers? Know anyone with some of these other eyelash oddities: no eyelashes, white eyelashes, extra-long lashes, or unusually curly lashes? Want more weird health news? "Like" The Body Odd on Facebook.